Suge Knight and Katt Williams are not guilty. At least, that’s what Suge Knight and Katt Williams say. Former hip-hop mogul Marion “Suge” Knight and comedian Williams pleaded not guilty to a robbery charge during their arraignment on Tuesday, a spokeswoman for the Los Angeles County District Attorney’s Office told TheWrap. Knight and Williams are accused of taking a photographer’s camera in Sept. 2014 outside a studio in Beverly Hills. Earlier this month, a judge determined that there was enough evidence for the case to go to trial. Knight and Williams are next due in court on Nov. 30 for a pretrial hearing. In addition to the robbery case, Knight also faces charges of murder and attempted murder stemming from a fatal car incident in Compton, Calif., in January, which left Terry Carter dead and Cle Sloan injured. Knight has also pleaded not guilty to those charges. Jane Fonda has definitely had some interesting experiences in her life. The 77-year-old actress reveals to The Hollywood Reporter that she once went skinny dipping with the late Michael Jackson -- as well as legendary actress Greta Garbo -- in the early 1980s. Fonda says Jackson came to stay with her for 10 days when she was filming 1982's On Golden Pond, and that her co-star, legendary actress Katharine Hepburn, initially disapproved. "When I first asked her permission ... she was not happy," Fonda recalls. "But then the crew said, 'You don’t understand, it's Michael Jackson.'" "She was very prickly," Fonda adds of the screen idol. "I mean, she was a snob, she was very moody, she was very judgmental." Fonda says Jackson lived with her at her house on the New Hampshire set, and that Hepburn not only eventually accepted him, but mentored him as well. "[Jackson] wanted to be a movie star -- he had just finished doing The Wiz," Fonda explains. "And he had a tape recorder with him, and every day I would bring him to the set, and in between scenes she would sit down in a chair and pull over a chair for him and tell him stories. ... And every story embedded a lesson." One lesson, she shares, had to do with theater and silent film star Laurette Taylor. Fonda says Hepburn saw Taylor in The Glass Menagerie and was moved by it, but saw her 25 or 30 years later, and "the magic was gone." "And she said to Michael, 'She wasn't hungry anymore' -- what a great thing to say to a young, rising star like Michael," Fonda now muses. "You gotta stay hungry. Don't ever phone it in. Don't ever take it for granted. You know what I mean?" And is Fonda still "hungry" to this day? "Oh, you have no idea," she swiftly answered back. This, of course, isn't the first time the Grace and Frankie actress has opened up about very personal experiences. While playing a game of "Never Have I Ever" on The Ellen DeGeneres Show in May, she surprisingly revealed she's a member of the mile-high club. "It was my fourth date with Ted Turner -- he has his own plane -- and we get on the plane and he asks, 'Are you a member of the mile-high club?'" she recalled about her third husband. "But I didn't know what he was talking about. And then I joined!" "Suddenly the seats became a bed," she joked. In the weeks leading up to the 19th anniversary of her son's death, Afeni Shakur found herself in an East Oakland, California, classroom trying to answer the question that's dogged hip-hop for the better part of two decades: Who killed Tupac? The elder Shakur was dressed in a white linen blouse that contrasted beautifully with her smooth dark skin. Her warm eyes set behind her slightly oversized glasses. Maybe she's used to that question. Maybe she's not. But on this day, the person asking who'd killed her son wasn't a journalist or a rival. It was a small boy, no older than 9, who just wanted to know. "It doesn't matter who killed my son," she said. "It matters why." That boy and his classmates at Roses in Concrete Community School are part of an ambitious, community-based experiment that supporters hope is packed with answers about that "why" — why so many young people of color are caught in a vicious cycle of violence, and when they do survive, how they manage it. Shakur, with her daughter, Sekyiwa Shakur, were special attendees when the school last week welcomed the inaugural class of 196 students in kindergarten through fourth grade. The school employs a full-time community organizer and begins each day with 15 minutes of meditation. The school draws its name and its mission from the poem, "The Rose That Grew From Concrete" written by a teenage Tupac. The piece was eventually adapted into a best-selling book of poetry published in 1999 after the rapper's death. "You wouldn't ask why the rose that grew from concrete has damaged petals," Tupac wrote. "On the contrary, we would celebrate its tenacity." Just as Afeni Shakur said and her son wrote, the Roses faculty knows it's important to nurture and celebrate that tenacity. Vidrale Franklin, the school's principal, put it to Mic this way: "For a lot of families, we're their last hope. They've bounced from school to school because their kids weren't being successful." Oakland is routinely ranked among the top five deadliest cities in the United States; many homicides occur in the stretch between the city's Lake Merritt and neighboring San Leandro that make up East Oakland. Jeff Duncan-Andrade, a longtime educator and cofounder of Roses, gave a TEDx talk in 2011 during which he showed the Oakland Tribune's homicide map across 13 years, or the amount of time a student usually spends in the city's public schools. "You tell me where a young person can live in my community where they don't personally witness homicide," he told the audience. What Oakland's children see: What Oakland experiences on a local level is part of what's only recently been identified as part of a long-simmering national epidemic: the impact of post-traumatic stress disorder in U.S. communities that are routinely under siege. Historically associated with combat veterans, PTSD is a clinical mental disorder sparked by exposure to a traumatic event and characterized by intense flashbacks, withdrawal, thoughts of depression and sometimes suicide. Nearly 8% of people in the United States will experience it at some point in their lifetimes, and anywhere from 11% to 20% of recent combat veterans have been diagnosed with the disorder, according to the U.S. Department of Veterans Affairs. But black America has been suffering from a PTSD crisis that's been largely ignored until recently. When researchers in Chicago started screening patients for PTSD in 2011, they found that 43% of patients — and more than half of gunshot victims — showed some form of PTSD, according to ProPublica. Urban youth are twice as likely as soldiers returning from Iraq to have PTSD, according to a 2007 study by Stanford University researchers. This problem is so prevalent it's earned its own name: CPTSD, or complex post-traumatic stress disorder. Instead of experiencing a traumatic event and then leaving it, as soldiers typically do, people who experience CPTSD are constantly exposed to their trauma over an extended period of time. The diagnosis "captures the complexity of young people living in urban poverty who return to the violence," Duncan-Andrade said in the 2011 TED talk. How this pain builds: That trauma isn't just bad for students, it can be deadly. In 1997, the year after Tupac's death, a landmark study asked more than 17,000 adults about their history with adverse childhood experiences, ranging from physical and sexual abuse to living with a caretaker who suffered from a mental illness or was frequently imprisoned. The results were sobering: Compared with children who suffered no adverse childhood experiences, those who experienced four or more had a 220% increase in heart disease, a 160% increase in diabetes and were 1,220% more likely to attempt suicide. The stress associated with poverty didn't just inflict emotional pain on children. If left unchecked, it would eventually kill them. But before it does, it will severely impact the way they learn. "They respond to the world as a place of constant danger," researchers at the Kirwan Institute wrote last year. "With their brains overloaded on stress hormones and unable to function appropriately, they can't focus on learning." That stress literally impacts their brain's development. 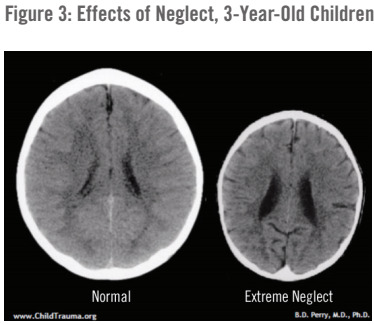 Eighty-five percent of the core areas of the brain develop by the time a child reaches age 3, but for those who experience severe trauma or neglect, the part of the brain that's responsible for memory of emotional control will develop much more slowly. For Zeyda Garcia, Roses in Concrete's counselor, the challenge of educating children with acute trauma is steep, but not insurmountable. "We're looking at our scholars as holistic human beings who are carrying everything in their lives into the classroom with them," she told Mic. "It helps having a staff of people who are on the same page and work from their heart and have the same desire." Roses' educators are no strangers to Tupac's poetry in the classroom. Duncan-Andrade told Emily Wilson of AlterNet, "'Pac's work is about seeing the full humanity of someone who endures suffering and trauma on a regular basis, and I think that's what the most successful adults working in our communities do. They acknowledge the hurt and the unearned suffering while at the same time acknowledging the tenacity and the will to reach the sun." In 2009, Duncan-Andrade laid out his theory on how educators can help grow roses from concrete in the Harvard Educational Review. "The ability to control, in a material way, the litany of social stressors that result from growing up in concrete is nearly impossible for urban youth," he wrote. Effective teachers were those who helped locate cracks in that concrete — food for the hungry, for instance — where children could flourish. Only three weeks into the school year, it's too early to tell how effective Roses will be in its mission. But the staff seems committed to the long haul. Reena Valvani taught bilingual education to kindergarten and first-graders in neighboring San Leandro for 13 years before joining Roses this fall. She was so inspired by its mission she also enrolled her second-grade son, Narayan. "I think we all anticipated coming into a very heavy workload and we've all been deeply humbled by how heavy that workload is," she said of the staff, which works up to 90 hours a week and on weekends. Still, she says, "it's incredible." Liza Morales, Lamar Odom’s ex and mother to his children seemingly broke her silence on Wednesday as the former NBA star remains in critical condition. Morales lives in New York City and was Odom’s longtime girlfriend, before he married Khloe Kardashian in 2009. Morales and Odom have two teenage children together, Destiny, and Lamar Jr. The former couple had a third child, Jayden, who died in 2006 of SIDS at just 6 months old. Sources confirm to ET that Morales and Lamar Jr. are traveling from New York City to Las Vegas with Odom’s aunt, JaNean. It is unclear whether Destiny has already made her way to the hospital. On Tuesday afternoon, Odom was found unconscious in a room at the Love Ranch, a legal brothel, in Crystal, Nevada. Odom was transported to Desert View Hospital, where he arrived at 4:15 p.m. Though arrangements were made to have Odom transported by helicopter, it was determined that he “was unable to be transported by air due to his stature,” and instead, was moved to Sunrise Hospital in Las Vegas. A source tells ET that the former NBA star suffered a heart attack and was placed into a medically induced coma. Kardashian has stayed by Odom’s bedside during his hospitalization. Sources tell ET that cameras are not running for the family’s reality series, Keeping Up With the Kardashians. Although Odom and Kardashian filed for divorce almost two years ago, ET has learned that the divorce is not yet official, which according to celebrity divorce attorney Vikki Ziegler, means that Kardashian could potentially still make medical decisions for Odom. Kardashian and Odom were married in September 2009, and split in December 2013. Sources confirm to ET that Odom has also been visited by Kobe Bryant and Lakers general manager Mitch Kupchak during his hospital stay. While there’s a lot to criticize Donald Trump the politician about, his business exploits are something to behold. That is so because as George Gilder frequently reminds us, it’s the proverbial “leap” that produces the crucial information necessary to power any economy forward. Over the decades Trump has taken numerous leaps; some that were very successful, and some that weren’t. The economy gained whether his ventures soared or wilted. If his net worth is less than $2 billion, more than $5 billion, or even the $10 billion he claims, his professional accomplishments have been brilliant. Still, without questioning for even a second what he’s accomplished in the business world, it’s worth pointing out that he may well be overstating it when he calculates $10 billion after compiling his assets and liabilities. To understand why, it’s useful to go back in time to the late 1980s. It was then that Security Pacific was the fifth largest U.S. bank, and Trump was arguably at the height of his business prominence. Trump sought a $50 million loan ($50M Security Pacific’s “house limit”) to revitalize the old Ambassador Hotel, which was most famous at the time in a macabre way for it being where Robert F. Kennedy was tragically assassinated in 1968. The hotel and the area in which it was located had since cascaded downward but Trump, full of the entrepreneurial confidence that defines high achievers, said he had a plan to revive the formerly great hotel.